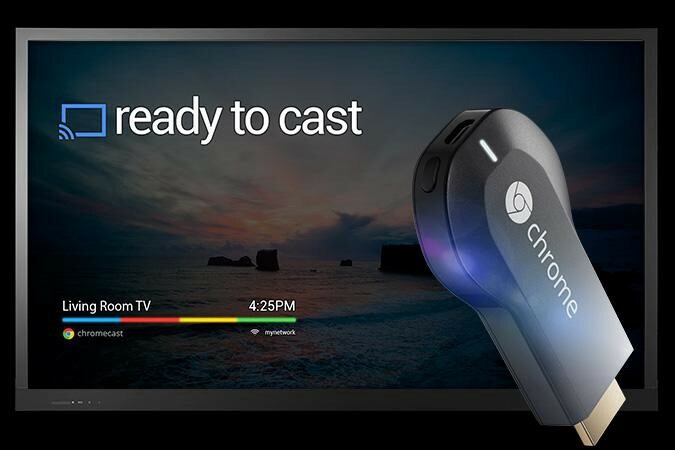 Chromecast, by now is a well-known product from Google which recently stormed the Indian market and is already awaiting a refresh for the hardware. It is by far the best and most affordable device to stream Internet media to your TV and has made LCD TVs comparable to the Smart TVs of today. Priced at $35, it has blown away the competitions like Apple TV and Roku, with none nearing that price point. The closest competition is priced at $99 including Google’s own Nexus Player and Apple TV. Recent statistics mention Chromecast overtaking the Apple TV (launched in Jan 2007) market within short period of 1.5 years. The device is officially available in India via the Online Shopping store — www.Snapdeal.com. Chromecast without the branding looks like a normal HDMI dongle and its size is comparable to an over blown USB drive of the early 2005 era. Chromecast being HDMI based provides all the features of HDMI cable connectivity, wirelessly. The audio and video are both supported for streaming. The device connects directly to the WiFi router and allows remote controlling via the Android or iOS devices or even using the laptop running Chrome browser on Windows, Mac OS X, Linux and ChromeOS. Unlike other streaming devices, Chromecast does not have a Remote controller. but relies on the power of the smartdevice like phones, tablets and laptop to act as remote controllers. Using these smart devices along with supported applications the user can enjoy — both Video and Audio,- stream YouTube, Google Play Movies and Google Play Music which are also the popular websites in India. It also makes the media look great on the large TV screens, through the High Definition playback of the content. My experience with the beast! 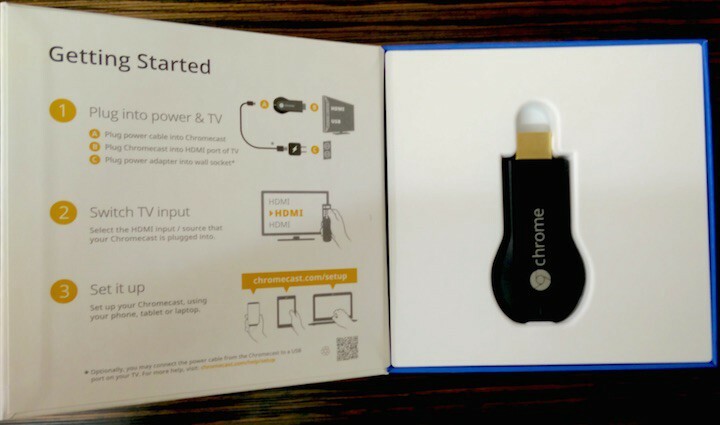 Chromecast was the first device that I ordered as soon as it was announced and launched by Google in June 2013. The device arrived in a neat and sleek package. 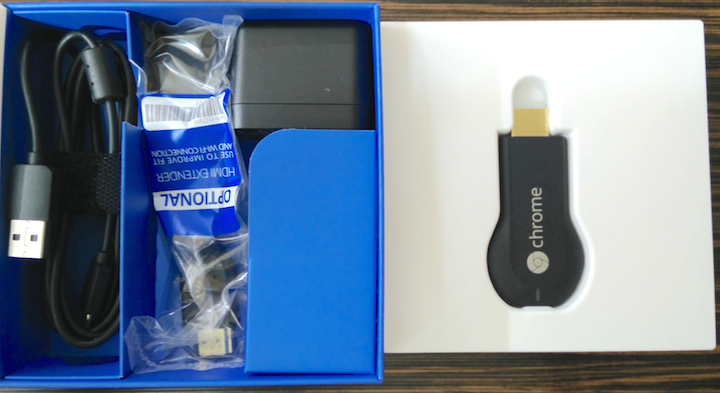 The box included the Chromecast HDMI dongle along with nicely packed — micro USB power cable, wall charger and a HDMI extender. The next step is to plug in Chromecast to your TV. A quick setup instruction on the Chromecast box explains it quite well. After plugging in Chromecast to the HDMI port on the TV, the Setup requires the user to visit the website http://google.com/chromecast/setup. The website, when accessed on the any smart device running the supported operating system, downloads a compatible application to setup Chromecast. Following the instructions on the Chromecast application the device can then be managed by any smartdevice connected to the same WiFi network as the Chromecast. One of the major reasons to make the Chromecast purchase was to ensure for the kids [b1] to enjoy the High Definition content on TV for infotainment media — music and video streaming. After it arrived, the kids could be kept engaged with a YouTube playlist of their favorite animation or as per their interest in clay modeling and doll house setup. Streaming the content on large screen allows better content consumption compared to viewing it on the small screens. Secondly, as Chromecast connects directly to the internet, it does not keep your smart devices locked down for streaming. This allows the Chromecast to continue streaming even after the smartdevice has moved out of the WiFi zone until the playlist it over. Chromecast lets the user create a playlist from one smartdevice or even the combination of all of these. This smartdevice then act as a remote control giving the freedom of play, pause, stop, forward, rewind and increase/decrease volume to the user. Chromecast is truly a Plug-n-Play device. Connected via HDMI and powered through a micro-USB, it houses an in-built WiFi chip. Chromecast requires smart devices for initial setup which further connects directly to Chromecast’s internal WiFi, to configure the WiFi network credentials. After the setup is completed and credentials for WiFi network are provided, it connects directly to the Internet. Chromecast will automatically update to the latest and greatest Chromecast software version via Over-The Air updates. The device directly communicates to the Internet through the WiFi Routers; hence it is really important to know the compatibility of your router before spending. A list of compatible routers is available on the Chromecast Support page. Chromecast also supports a feature called as CEC — Consumer Electronic Control, present in the TVs. If you are using a CEC compatible TV, you can turn On the TV and switch to the HDMI input directly from your smartdevice. Please note that in order for CEC to work (if CEC is supported by your TV), your Chromecast must be powered by a power outlet. Manufacturers often call CEC by different names, including Anynet+ (Samsung), Aquos Link (Sharp), BRAVIA Link and BRAVIA Sync (Sony), HDMI-CEC (Hitachi), CE-Link and Regza Link (Toshiba), SimpLink (LG), HDAVI Control, EZ-Sync, VIERA Link (Panasonic), EasyLink (Philips), and NetCommand for HDMI (Mitsubishi). While Chromecast is all good, there are still few flaws related to hardware and software that Google needs to address. Chromecast currently support only WiFi 2.4 GHz channel, which surely needs to be enhanced to 5.0 GHz for stronger and upto industrial WiFi standards. On the software front, Chromecast lacks the support for local media streaming on both smartphones/tablets and laptop/computer. There are third party applications which support it but Google is expected provide official support rather than the work around by these apps. Chromecast is a device you will surely fall in love with, after you have used or seen it in action once. The device has been in constant focus by Google and has been receiving its fair share of the updates and features. Recently, Chromecast did get the initial taste of gaming for its platform, which is very basic right now. I personally would love to see the gaming platform evolve at least to a mid-level gaming console. 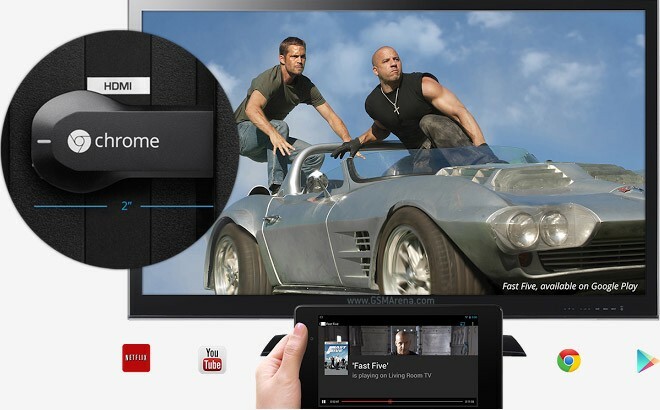 This would allow Chromecast to work along with Android and iOS devices as it’s controller. In my opinion, Chromecast is definitely a beast in a disguise packaging, however, the full potential of the device is yet to be explored. Chromecast is available in India through [Snapdeal](http://www.snapdeal.com/product/google-chromecast-hdmi-streaming-media/1709999463?utm_source=aff_prog&utm_campaign=afts&offer_id=17&aff_id=86156' target=_blank) for INR 2999.